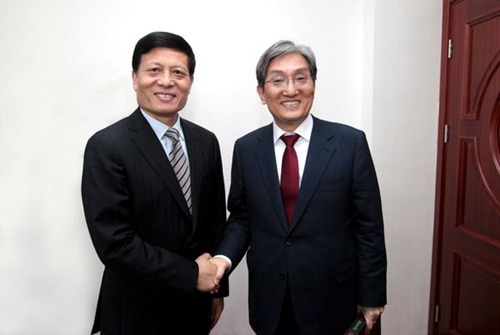 On April 10, Xie Fuzhan, president of the Chinese Academy of Social Sciences (CASS) and secretary of the Leading Party Members’ Group of CASS, met with a delegation led by Noh Young-min, South Korean ambassador to China. The two sides exchanged views on such issues as bilateral relations and academic cooperation. After extending a warm welcome to Noh, Xie said that the relationship between China and South Korea occupies a vital position in China’s foreign relations. The two countries are important trade partners and their economies are highly complementary, Xie said, adding that bilateral mutually beneficial cooperation continues to deepen. Noting that China-US trade friction has been escalating in recent years, Xie said the trade imbalance between China and the United States mirrors the trade imbalance between Northeast Asia and the United States to a large extent. The imbalance is determined by the comparative advantage of Northeast Asia in the world industrial pattern and the problematic economic structure of the United States, so it is unwise for the United States to impose trade sanctions, Xie said. The South Korean government has recently decided to suspend tariff concessions on certain goods from the United States due to steep tariffs imposed by the United States on South Korean products. Xie said the move taken by the US administration will jeopardize the interests of other countries and its own as well. Both important countries in Northeast Asia, China and South Korea have many common interests in such fields as economy and security, Xie said. Enhancing mutual political trust, increasing economic and trade contacts, and promoting people-to-people exchanges are important to improving the wellbeing of the two peoples and maintaining world peace, he added. Xie then gave a brief introduction to CASS. Stressing that CASS and the South Korean academic community have maintained long-term friendly exchanges, he expressed the hope that Chinese and South Korean academics can, with the support of the South Korean Embassy in China, conduct richer exchange activities, such as cooperative research programs, seminars and mutual visits of young scholars, constantly lifting the level of bilateral cooperation in humanities and social sciences. Noh said that South Korea is an adamant supporter of free trade and is willing to strengthen economic and trade cooperation with China. The South Korean Embassy in China expects to work closely with CASS to facilitate exchanges between academics and think tanks in the two countries, and to intensify people-to-people exchanges and policy communication to advance China-South Korea relations, Noh said.